Travel Day two…into Winnipeg then the USA. We’re taking the southern route. We’ve never been this way before. Yesterday’s observation: there are alot less bugs living in Saskatchewan today than yesterday. That’s it. The boxes are filled, recorded on our inventory, numbered and sealed. We’re ready for the big day Friday…loading the truck. For 28 years I’ve never seen a moving truck that didn’t cause me a brief bit of anxiety. Whether it’s one by the side of the road loading someone else’s belongings, or we pass one on the highway. A moving truck just solicites an emotional reaction from me. The truck just represents change. Often big change, significant change and of course geographical change. This time we’re leaving Alberta without Philip and Amanda. How we will miss them. Getting together for a weekend just isn’t possible when you’re 4000 km away. Speaking of distance – we’ve got the route mapped out and we’re trying a different way to Southern Ontario this time. We’ve driven the northern route a couple of times. This time we’ll go under Lake Michigan crossing at Port Huron. But that’s a few days away yet. Soon it’s time to load the moving truck! What do you keep on your fridge door? We always have magnets, and usually they are holding up pictures of family and friends. The photos are all packing – and for the most part so are the magnets. But not all the magnets! 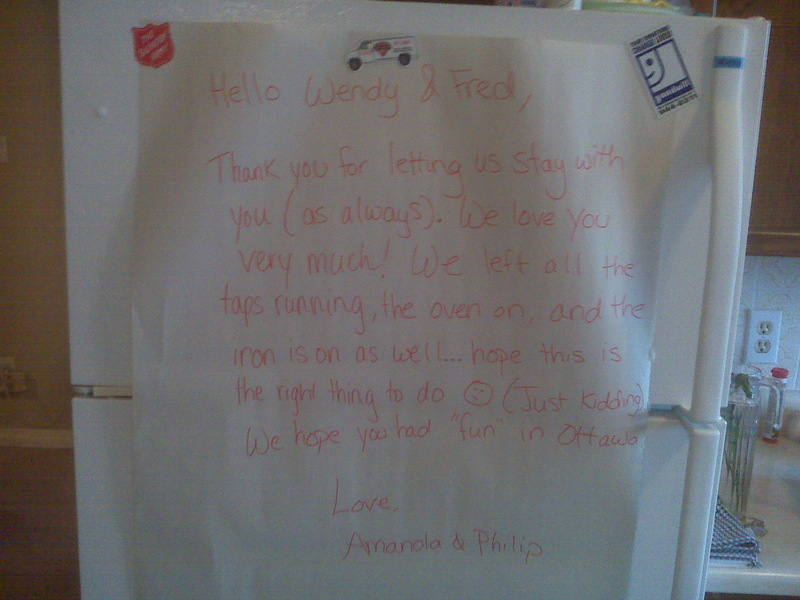 Tonight we arrived home from a week in Ottawa and found this lovely note from P&A on our fridge door. It’s a photo off my BlackBerry so it’s not the best quality (oh for an iPhone) but I think you can read the lovely note we read as we came through the door. Have a told you what great “kids” we have? Well they aren’t really kids – they are grown ups…but to us we’ll always think of them as the joy of our lives and four individuals who we want to be parents to! Oh, and the best part…they are the parents to those coming grandchildren!! !